Key concept - Relations - What are the links between microorganisms and our health? Related concepts - Function, Balance and Consequences - Does investigation and understanding of the interaction between ourselves and pathogens help us achieve equilibrium in our physical well-being? Global context - Globalization and Sustainability - Which are the reasons for the differences in health between different countries? Would it be possible for everyone to have access to proper health care? Health is a complete state of physical, mental and social well-being, and not merely the absence of disease or infirmity. The tasks and questions on the Weebly will be coloured to represent the different style of questions that you will find in your exams. The task should be completed in your "Natural Sciences" GoogleDrive document. There will also be "extension" tasks for students who finish tasks quickly! Also look out for links to interactive resources and videos. The cell is the basic structural, functional and biological unit of all living things. For this reason, it is considered the smallest collection of matter that can be classed as alive; a cell is the smallest form of life. Prokaryotic cells are simple cells that do not have a true nucleus. They have simple organelles, but lack membranous organelles, and they have a cell wall. 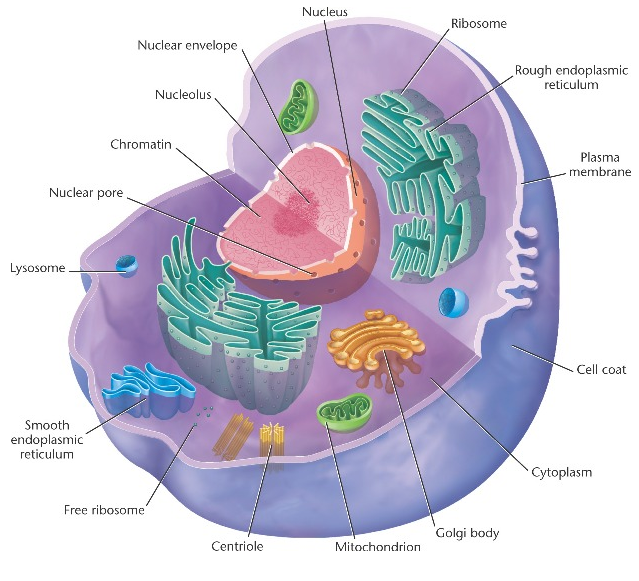 Eukaryotic cells are those which do have a true nucleus. They are larger than prokaryotes, do not always have a cell wall, and have organelles which perform specialised functions. a) Insert a table and use it to compare and contrast prokaryotic and eukaryotic cells. b) Explain why a cell from our body cannot live separately from the rest and yet the single cell of a protozoan can survive on its own. There are two types of eukaryotic cells, plant and animal. In this unit we are going to study animal cells, as we will later talk about human tissues, organs and systems, which are indeed made of animal cells. Cell or plasma membrane: Formed by a phospholipid bilayer that surrounds the cytoplasm. It functions as a selective barrier which separates the cell’s contents from its surroundings. It controls the exchange of materials such as nutrients and waste products. The plasma membrane is a partially permeable membrane, allowing some substances to cross freely, but not others. The molecules which can pass through the membrane are relatively small. Large molecules, or those with the incorrect electrical charge, are unable to pass through the membrane but when required; they can cross via a special transport system. Cytoplasm: The cytoplasm is the cellular content excluding the nucleus. It is formed by an aqueous solution with organelles embedded in it. Mitochondrion: The mitochondrion is an elongated-shaped organelle enclosed in an envelope of two membranes. It is the site for cellular respiration, the process by which the cell obtains energy (ATP- Adenosine triphosphate). Endoplasmic reticulum: The endoplasmic reticulum (ER) is a series of connected flattened sacs and membranous tubules. If the endoplasmic reticulum has ribosomes attached, it is called rough ER, and if not, smooth ER. Its function is the production of several substances, such as lipids in the smooth ER and proteins in the rough ER. Ribosomes: Ribosomes are tiny organelles found free in the cytoplasm or attached to the membranes of the endoplasmic reticulum. Ribosomes are made of RNA (ribonucleic acid) and proteins, and are the site of protein synthesis. Golgi apparatus: A series of flattened stacks of membrane-bound sacs (disclike compartments called cisternae), surrounded by small vesicles. In these vesicles, lipids and proteins synthesized in the ER are chemically changed and prepared for secretion (export to the outside of the cell). Lysosomes: These are membrane-bound vesicles that contain digestive enzymes. They carry out the digestion of large molecules or old organelles. Cytoskeleton: System of protein filaments that form complex networks in the cytoplasm of the cell. It gives a cell its shape and is very important in cell division (or mitosis). Centrioles: Centrioles are small hollow cylinders made up of bundles of microtubules. They direct the movements of the cytoskeleton and are involved in cell division (or mitosis). Nucleus: The nucleus, which is usually spherical, is found in the centre of the cell. It contains the genetic material (DNA) with the information to control all cellular processes. We will look at the nucleus with its different structures and chromosomes in detail in unit 5.
a) Draw a cell and label its organelles using Google Draw or similar. b) Draw a nucleus and label its parts. Copy your diagrams by highlighting them in Google draw and using the shortcut Ctrl+C. Paste them into your NSD by using Ctrl+V. You will be extending your glossary throughout this year, so give it an appropriate title and place in the same folder as your NSD. You can copy and paste the relevant sections into your NSD using the above shortcuts. Extension: How many chromosomes do humans have? In unicellular organisms, such as paramecium, an individual cell needs to carry out all the life processes. However, in multicellular organisms, cells become specialised and work together, unable to survive on their own. Humans are multicellular organism composed of eukaryotic cells. Even though the size and shape of our cells vary according to function, we could say that they all share the same basic structures, having three main parts: the cell membrane, the cytoplasm and the nucleus. Cells that perform the same function can work together and form tissues. A tissue is a group of similar cells that together, carry out a specific function. There are different tissues in our bodies which perform specific functions; for example, epithelial tissue covers the outside of the body, and muscle tissue is the main component of muscles and it is responsible for movement. To perform different functions, different tissues can work together and make organs. An organ is formed by the functional grouping of several tissues to perform a new function. The brain, heart, stomach and liver are examples of important organs in our body. In the same way, different organs work together to make systems. A system is a collective functional unit made of several organs which work in complete coordination with one another to perform a complex function. The digestive, the circulatory and the respiratory systems are some examples of the systems that make up our bodies. Multicellular organisms are made of many different organs and systems that are coordinated. In the previous section we saw that the content of the cell is surrounded by a partially permeable membrane called the plasma membrane. This barrier is essential for transporting and regulating the materials that go in and out of the cell. As already mentioned, this plasma membrane has selective permeability; that is, it allows some substances to cross it more easily than others. There are different mechanisms by which molecules may be transported across the plasma membrane. Small molecules go across the plasma membrane by diffusion, osmosis, or active transport. Larger molecules across the membrane, usually by endocytosis and exocytosis. Molecules (including ions) in a liquid or gas are constantly moving and tend to spread out into the available space. If we place a membrane separating pure water from a solution of dissolved dye in water, and assuming the membrane is permeable to the dye molecules, the dye molecules will move randomly. However, they will tend to diffuse to the side where there is just pure water until they are evenly spaced and reach equilibrium. If there is a region of high concentration, and another of low concentration, there is a concentration gradient between these regions. A substance will diffuse from where it is more concentrated to where it is less concentrated, or down its concentration gradient. 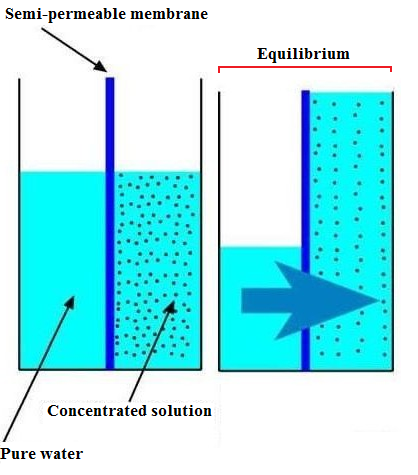 Diffusion is the movement of particles within a gas or liquid from a region of high concentration to a low concentration (down a concentration gradient), until an equilibrium is reached. In a cell, when diffusion takes place, we talk about passive transport, as the cell does not have to spend energy for diffusion to occur. Osmosis is a form of diffusion in which only water molecules move. The tendency of water molecules to move from one place to another is measured as the water potential. 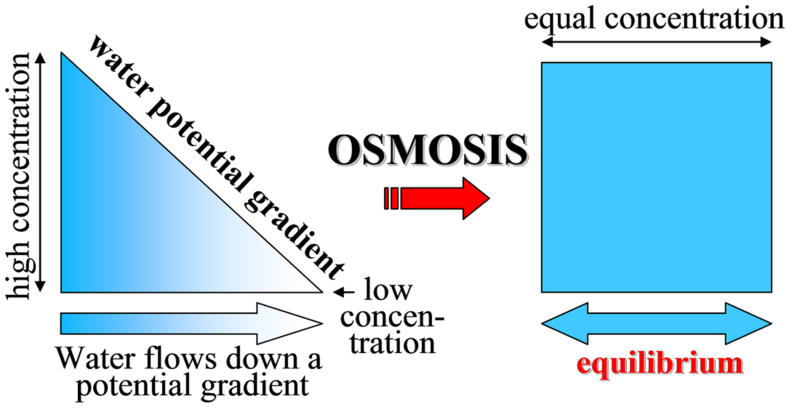 Osmosis is the diffusion of water molecules from a region of higher concentration of water to a region of lower concentration of water, down a water potential gradient, through a partially permeable membrane. As we have seen earlier, particles move from one place to another by diffusion, but only until equilibrium is reached. If there is no concentration gradient between the two places no diffusion will occur. Sometimes cells need substances which are found at lower concentration outside the cell. 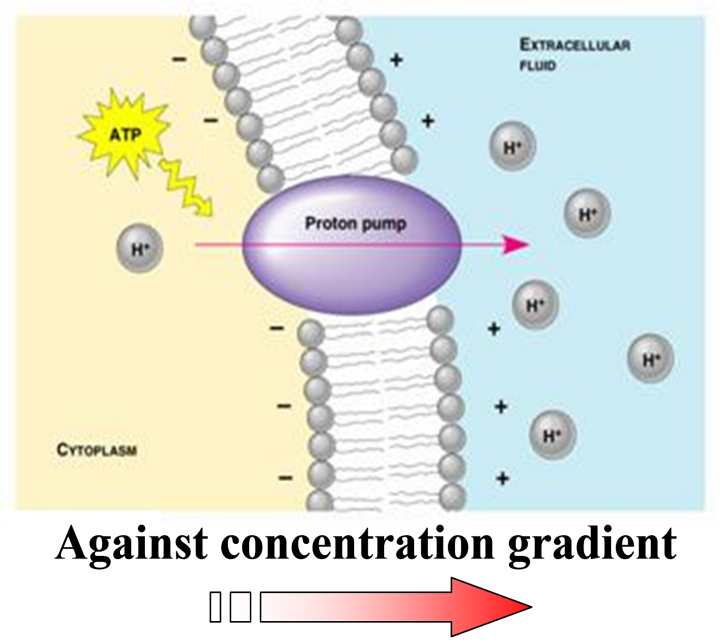 In active transport, protein molecules (called carriers) in the plasma membrane pick up and carry particles across the membrane, in the opposite direction of diffusion (against a concentration gradient). The procedure is an energy-consuming process, as the substance must be moved against its natural tendency to diffuse. Active transport is a method by which particles are moved against a concentration gradient. This movement requires energy (ATP) and involves protein carriers in the plasma membrane. Some particles are too big to cross a membrane by diffusion or by active transport. In these cases, an infolding or extension of the cell membrane will engulf the molecule and form a vesicle to transport it. 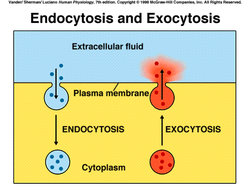 Endocytosis and exocytosis are active processes involving the bulk transport of materials through membranes. This can be either into the cell, endocytosis, or out of the cell, exocytosis. a) In your glossary, define: concentration gradient; passive transport; and active transport. b) In your NSD, explain osmosis with an example and then use this to write a clear definition of osmosis in your glossary. Extension: Suggest why the above processes are important in human biology. According to the World Health Organization (WHO), a healthy life is not just a life without disease. 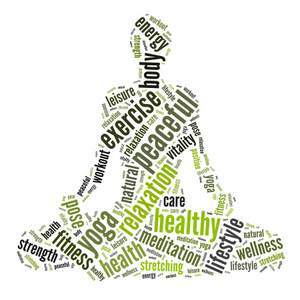 A healthy life presents a complete sense of well-being including physical, mental and social well-being. The physical, mental and social states of a person are in continuous interaction. Therefore, a change or alteration in any of the three could cause an imbalance leading to disease. Four main factors should be considered when talking about being healthy and free of diseases. a) A healthy environment, that is to say, an environment for example, without pollution, noise, dangerous animals and violence. b) Healthy habits and life style. c) Hereditary factors and age. d) A Health system that can help prevent the appearance of illness. When a part of our body is altered and cannot carry out its functions normally, we say that we are ill. An ill person will show a series of symptoms of the disease. These symptoms are subjective and only the patient perceives them. Some include feeling dizzy, tired or in pain. Signs, on the other hand are more objective and can be seen/measured by others, such as: fever, vomiting, swollen areas, sudden rises or drops of blood pressure, abnormal parameters in blood tests or electrocardiograms etc. There are two basic types of diseases: Infectious and non-infectious. Infectious diseases are those caused by other living organisms, which are called pathogens (or pathogenic organisms), usually micro-organisms such as bacteria or viruses. An infectious disease is passed on from one individual to another. For example AIDS, or the flu. 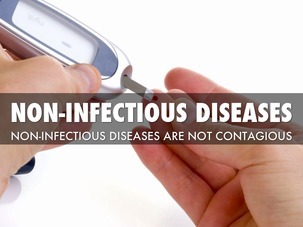 Non-infectious diseases may have a number of causes, but are not caused by a pathogen. A non-infectious disease is not passed on from one individual to another. For example, cancer or depression. Some diseases are acute, meaning that they happen in a limited time span, such as the flu. However, others are chronic, developing slowly and often lasting for the rest of someone's life, such as arthritis. Sporadic diseases, which happen occasionally. E.g. Heart attack, blood clot (thrombus or stroke), etc. Endemic diseases being those that only affect a particular area. E.g. malaria, in tropical regions. Epidemic: when large numbers of people suffer it in a short period of time. E.g. The flu at certain times of the year. If an epidemic spreads throughout many countries or even world-wide, it is called a pandemic (E.g. AIDS). Follow this link to learn more about disease control. 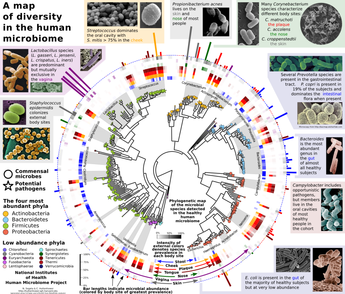 Infectious diseases (Some background of interest: Heterotrophic organisms can be: symbiotic – if they live in association with another organism; saprophytes (or saprotrophs) – if they feed on dead organic matter in decomposition; and parasites – they live on the body of a host and cause it some harm). As mentioned above infectious diseases are caused by a living organism (pathogen), usually a micro-organism, or by a substance (a toxin) released by it. Remember, that not all bacteria are pathogenic. Bacteria are unicellular prokaryotic organisms. Most of them are saprophytes or symbiotic organisms, and only a few species are parasitic, causing diseases. There are even some bacteria which are beneficial to humans, such as those found in our digestive track, which help with the formation of faeces and the production of vitamins. Hint: Are the above images too small to read the text? If so, hold Ctrl and press "+", or hold Ctrl and roll the top wheel on your mouse to zoom-in. * Some bacteria cause diseases (as most of them are saprophytes or symbiotic organisms, and only a few species are parasitic). Some diseases caused by bacteria are: pneumonia, tuberculosis, salmonella, tetanus, cholera and diphtheria. * Some protozoans (unicellular organisms) such as PlasmodiumPlasmodium, which causes malaria, or Trypanosoma which causes sleeping sickness. * Fungi. Can be unicellular or multicellular organisms, and the illnesses caused by fungi are called mycosis. E.g. .Athlete's foot, candidiasis (oral or genital thrush), seborrhoeic dermatitis. * Viruses: Diseases caused by a virus are called virosis. Viruses are not considered ‘alive’ as they are not made of cells, and they cannot survive and reproduce outside the cells of their host. A typical virus has genetic material and a protein coat, and sometimes there is a lipid layer that envelopes the protein coat. They do not have any cellular structure. All viruses are pathogens, being responsible for many of the most serious human diseases. Some important viral diseases are: the flu, measles, AIDS, and rubella. How are infectious diseases passed on from one individual to another? Direct contact. Such as sexual transmitted diseases (STD's) e.g. syphilis. Contaminated foods. Such as salmonella. Air. Such as the flu. Transmission vectors, which are animals that do not have the disease but transmit it, by introducing in a healthy individual of another species the micro-organism that causes the disease. E.g. Malaria is transmitted by the mosquito Anopheles, which carries the parasite Plasmodium. Also sleeping sickness, caused by the parasite Trypanosoma, which is transmitted by the tsetse fly. 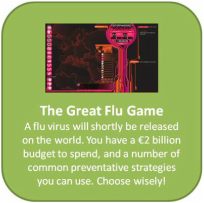 Use this link to play various games to explore infectious diseases. * External or passive: Avoiding the entrance of the pathogen inside the organism. - Physical barriers, such as the skin or mucus secreting cells. * Biochemical barriers, such as the enzymes in our tears, or the acid in our stomach. - Ecological barriers, such as the intestinal flora. - Mechanical barriers, such as mucus. * Internal or active: organisms or pathogens that have crossed the external defences and are inside the body are removed or destroyed by white blood cells, which form part of the immune system. These potential pathogens have particles on their surface called antigens, and these are recognised and destroyed by phagocytes (unspecific immune response) and by antibodies (specific immune response). In unspecific response, phagocytes (type of white blood cells) engulf and destroy the pathogen with digestive enzymes. There are many phagocytes present in areas of the body likely to suffer infection. E.g. the exposed surfaces of the lungs. In specific response B-lymphocytes (type of white blood cells) produce specific antibodies, protective proteins specific to one antigen. These antibodies are able to recognise the antigens found on the surface of pathogens, bind to them and facilitate their destruction by other cells. Infectious illnesses can present a big risk to our health. That is why is important to try to prevent them by having a healthy lifestyle and making sure that we get vaccinated against certain diseases. Having a healthy lifestyle would include having a good hygiene, following a healthy diet, avoiding any drug use, including medication that is not prescribed by a doctor, getting enough rest, having regular medical check ups, etc. All these habits will boost your immune system and keep it in good shape. 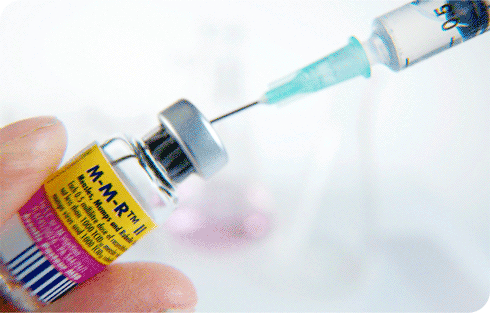 Vaccination consists of introducing dead, weakened or partially weakened microbes into a healthy organism so the healthy organism will produce antibodies against them. If a person gets in contact with these microbes again the organism will ‘remember’ (acquired immunity) them and produce specific defences fairly quickly which will stop the infection from happening. Serum therapy or serotherapy: Based on the injection of antitoxins or serum containing specific antibodies which have been produced by another person or animal to an ill patient who may need them quickly, for example in the case of having tetanus or rabies. Drug therapy: Based on the administration of chemical substances or medicines. These are drugs that act against microbes. The most important of those are antibiotics. Antibiotics are antimicrobial substances produced naturally or artificially which is only active against bacteria and some type of fungi. They should never be taken for a viral infection. It is also important to remember that you should not take them unless it’s necessary and prescribed by a doctor as bacteria become resistant to them, which makes them less effective or even useless. It is also important to follow the doctor’s prescription properly in terms of (with regard to) dosage and duration of the treatment in order to avoid increasing the resistance of bacteria to them. * Diseases that affect the normal functioning of systems or apparatus, such as coronary heart diseases or respiratory diseases. *Traumatic diseases, such as sport injuries, or domestic, traffic or work accidents. * Endocrine and metabolic diseases: these are caused by excessive or deficient secretion of a hormone or by malfunctions in the metabolic reactions within the body’s cells. Examples include some forms of obesity and diabetes. 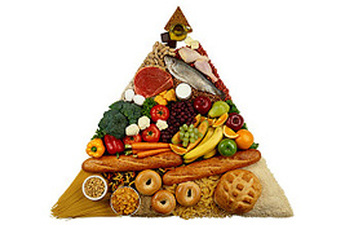 * Deficiency diseases: a poor diet may deprive the body of some essential substances; such as anaemia (iron deficiency) or goitre (iodine deficiency). * Psychological / mental disorders: changes in the working of the brain may lead to abnormal behavior, such as. Schizophrenia, depression, anorexia and bulimia. * Genetic diseases which are present at birth and are caused, at least in part, by a genetic disorder (the affected person’s genes), e.g. certain types of blindness. Those diseases caused by a genetic defect that a person inherits from their parents are called hereditary diseases. Some of this type of diseases can be limited or prevented by adopting certain healthy habits. * Cancer: It is a type of disease where a group of cells show uncontrolled and rapid division, invading and destructing other tissues, and sometimes metastasise (spread to other locations in the body via lymph or blood).giving rise to a mass of abnormal cells known as a tumour, that invade and kill other cells. Benign tumours: which are self-limited, and do not invade or metastasise. Malignant tumour or cancer: when the cells divide with no limit and extend to other organs (metastasis). -When you reach a certain age, ensure you have regular medical check-ups. How to prevent non-infectious illnesses. * Do not smoke. Do not do drugs (alcohol is a drug). * Avoid excessive sun exposure without protection. * Have a healthy diet. * Have regular medical check-ups after you reach middle age. * Get enough rest. Avoid too much stress. * Always follow safety instructions. Task 1XX: Research diseases that are directly related to an unhealthy diet and summarise your research with in-text referencing in your NSD. Extension: Suggest why we need to eat. A transplant is the moving of an organ or tissue from one body to another, in order to replace it. The person that receives the organ or tissue is the recipient and the person that donates is the donor. Transplants of organs and tissues. As our cells die, they are replaced by new ones. The cells within organisms that have the ability to divide and differentiate into various cell types are known as stem cells. There are two types of stem cells: embryonic, which can develop into any cell type and tissue specific, which are in certain tissue types and can only produce new cells of that particular tissue. · Keeping the organ that is going to be transplanted in optimum conditions. · Rejection: It is the main problem after a transplant. Nowadays, we try to avoid this by using immunosuppressive drugs, which lower the recipient’s immune system defences. The problem is that a person with a lowered immune system cannot fight against infections. Tobacco, alcohol and other drugs can not only be addictive, but very harmful for our systems putting our life at risk. As mentioned before, many drugs are used as medicine and need to be used as prescribed by doctors to avoid any problems. However, there are also drugs that people consume just to feel good, which can damage physical and mental health and are often illegal. Some of these include: tobacco, alcohol, THC( cannabis), cocaine, amphetamines and hallucinogenic substances among others. The drugs that people use to feel good act on the central nervous system, and usually create tolerance and addiction. When a person uses a drug often, their body gradually develops resistance to the action of the drug and adapts to it; this is called tolerance. As a person develops tolerance to a particular drug, he/she will need to increase the dosage of the drug in order to obtain the same effect. * Physical dependence: A lack of drugs affects the functions of certain organs. The effects include vomiting, shaking, intense sweating, diarrhoea, aches and pains, etc. These symptoms are referred to as abstinence syndrome or craving. (craving: very strong desire for something). * Psychological dependence: Drugs change the way the brain works and give users a sense of pleasure and well-being that ends as soon as they stop using them. When a drug addict is not taking the drug he/she feels uneasy anxious and dissatisfied. Short term health consequences: These are mainly related to the intoxication produced by the presence of high levels of the drug in the body. The effects will vary according to the type of drug and dosage ranging from drunkenness, convulsions, high blood pressure, abnormally high heart rate, to even coma or death. Drug users are also at higher risk of suffering accidents, as their perception of reality is altered. Medium and long term consequences: Most drugs damage the nervous system and cause some type of dementia, psychosis and/or behavioural disorders. In many cases they also cause damage to the liver, and the respiratory and circulatory systems. When the drug is injected, the risk of transmitting infectious diseases such as HIV or hepatitis B also increases. Social consequences: Drug addiction causes many social problems to drug addicts, as they gradually lose interest in their studies, work, friends and family, becoming a pest for society. It as well causes problems to society, as they may do whatever is necessary to obtain the drug (often expensive). Cabrera Calero, A. and Sanz Esteban, M. (2012). Biology and Geology 3ºESO. Madrid: Oxford University Press. Pedrinaci, E., Gil, C., Pascual, J. and Hidalgo, A. (2015). Biología y Geología 3ºESO. UE: Savia. Pickering, W. (2006). Complete biology for IGCSE. Oxford [England]: Oxford University Press.